The Assad regime and its allies have continued their low-intensity attacks on Idlib’s de-escalation zone despite a ceasefire agreement, local sources told Anadolu Agency on Wednesday. Regime forces and Iranian-backed terrorist groups have continued to shell villages in rural areas of Latakia, southern Idlib, western Aleppo, and northern and western Hama. Local sources told Anadolu Agency that regime forces had targeted the villages of Lataminah and Abu Ubeid in Hama; Al-Rashideen and Kafr Hamra in Aleppo; Temania and Tal Marak in Idlib; and Kurdish Mountain in Latakia. The low-intensity attacks have reportedly killed a civilian and wounded six others. Armed opposition factions and the Hayat Tahrir al-Sham group reportedly responded to the shelling with artillery barrages. Syria’s northwestern city of Idlib, most of which is under the Free Syrian Army (FSA)’s control, is located just across the border from Turkey’s Hatay province. Currently, Idlib is Syria’s last opposition stronghold. The east, west and south of the city remain under siege by Iranian-backed militants, roughly 60,000 of whom have been deployed around Idlib. While the moderate opposition has more than 70,000 fighters in the region, Hayat Tahrir al-Sham and other groups can field some 20,000 fighters. During last year’s talks in Astana, Turkey, Russia and Iran designated Idlib -- which saw some of the conflict’s worst violence -- as a de-escalation zone, in which acts of aggression are expressly prohibited. In October of last year, Turkey established 12 ceasefire observation posts in the Idlib de-escalation zone. Within the last four months, the Assad regime has seized three other de-escalation zones (in Homs, Eastern Ghouta and the Daraa-Quneitra front), and has now set its sights on Idlib, where some four million civilians reside. 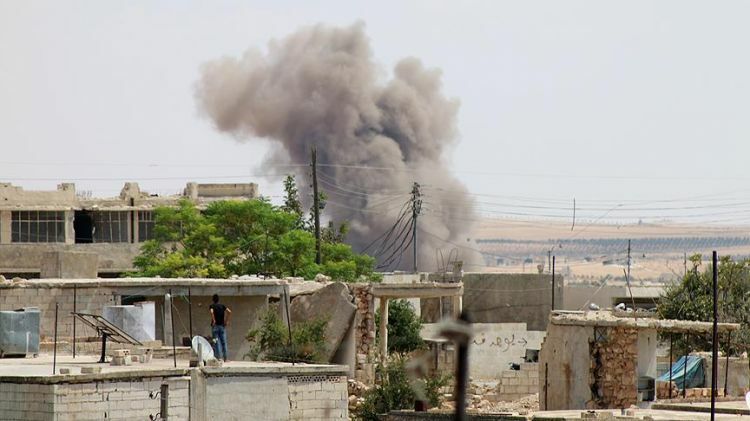 Since the regime began carrying out airstrikes in southwestern Idlib and northern Hama, Turkey has ramped up diplomatic efforts with a view to preventing further escalations in the region. It was feared that the armed conflicts in Idlib would lead to considerable civilian losses, trigger a fresh wave of emigration, and allow terrorist groups to infiltrate the city. Within the framework of proposals made by Turkish President Recep Tayyip Erdogan at a Sept. 7 meeting in Tehran, Erdogan and Russian counterpart Vladimir Putin later agreed in Sochi on the need to take additional measures to maintain the ceasefire. That agreement heartened civilians in Idlib, more than 50,000 of whom have since returned to their homes.